We’re looking at the four full-season staffs, guessing the roles, and talk about the changes of the staffs from the end of last year til now. Next up: Harrisburg. See here for Syracuse review. And don’t forget the invaluable work of SpringfieldFan maintaining the Nats Big Board, now in its 12th season! Note: in the below list, “missing” means that the player was on a 2016 roster, is still listed as active but is not found anywhere on a 2017 full-season roster as expected. Most are still sitting in Extended Spring Training (abbreviated XST throughout) with the intent of getting assigned as injuries or releases occur, but some may be release candidates. Other abbreviations I use often: MLFA == Minor League Free Agent, OOO = Out of the Organization. Quick Note: just prior to publishing word came out (h/t as always to Mr. Erickson) that a shake-up has already occurred in Harrisburg’s rotation. I’ll strike-out existing text and replace it with updated. There’s some familiarity with this staff from the end of 2016: seven of the guys on this staff were there last September. 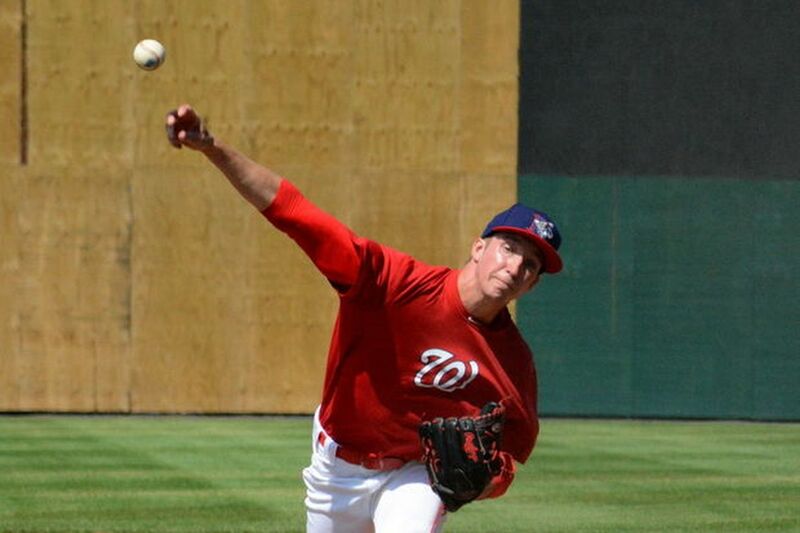 The Nats continue their trend of having their high profile players aim for mid-season promotions as opposed to the beginning of the season: Erick Fedde only had 5 AA starts last year but by all accounts from his spring performance is ready to test himself at least at AAA if not doing a Jordan Zimmermann like jump straight from AA->Majors. Rotation discussion: There’s more “starters” than there are spots; Phillips Valdez got 16 so-so starts in AA last year and will look to improve. Austen Williams is probably getting his last shot to start before getting pushed to the bullpen. Local guy Greg Ross (from Baltimore, went to Frostburg State) was a 2016 MLFA pickup who dominated … i’m kind of curious to see how how does in a full season. MLFA signing Gabriel Arias has a ton of AAA time and may be over-qualified for this rotation, and got sent to the D/L just before season’s start. He’s been replaced by 2016 rotation member Mark Blackmar, who re-signed to extend his MLFA deal in the off-season. I’ve listed both Jaron Long and John Simms as “spot starters” for now, though I think both deserve a shot at starting on a regular basis. We’ll see if they switch places with some of the more shaky starters here. 30th round draftee Tyler Mapes starts on the D/L after a great season at AA last year; perhaps he gets pushed to AAA when he comes off the D/L. In the bullpen, some surprises. Why is 40-man roster member Jimmy Cordero in AA? How did top 2013 draft pick Jake Johansen make the AA squad despite never succeeding anywhere outside of Low-A? Derek Self will be spending his fourth successive year at Harrisburg; there’s more than 40 arms sitting in XST right now; does it make sense to have a guy who clearly isn’t rising up taking a full-season roster spot at this point? Off-season MLFA Braulio Lara in AA after years in AAA? Am I being too critical here? It just seems like some curious picks for our AA squad. Listed as “Missing” include the return of J.D. Martin as a knuckleballer; he’ll remain in XST until a spot opens up in AA or AAA. 2016 MLFA signing Mark Blackmar ended the year in AA but didn’t make the team; i’m guessing they’re trying to figure out how he fits in after dominating High-A but struggling in AA. Lastly two guys who I have as “release candidates” are not assigned but not yet cut in long time Nats farm-hands Robert Benincasa and Brian Rauh. Who am I focusing on: Fedde obviously. Ross and Simms intrigue me, as does Mapes. Brinley was *so good* in Potomac; really want to see him succeed in AA as a 27th rounder. Want to see what we have in Cordero. OK here we are. We did seven comprehensive pitching staff reviews (the GCL review is here, which has links to the other 6 reviews) in order to arrive at this post. Detwiler gets one last shot at the 5th starter as the incumbent, pushing Jordan to AAA and Ohlendorf/Roark to the bullpen (my current prediction). Jordan wins the 5th starter, pushing Detwiler to the bullpen as a power lefty by virtue of his lack of options. This would push (likely) Roark to AAA. Roark wins the 5th starter, continuing his blistering sub 2.00 ERA pace from September, pushing Detwiler to the bullpen and Jordan to AAA. Less likely, Karns wins the 5th spot, which pushes Detwiler to the bullpen and Roark & Jordan to AAA. Even more less likely, Ohlendorf wins the spot, which pushes Detwiler to the bullpen but lets Roark stay as the long man/spot-starter. Mike Rizzo shocks us again with another starter acquisition; Detwiler goes to the bullpen, Ohlendorf stays as long man, and Roark & Jordan are in AAA. Why am I predicting Detwiler will win the rotation spot? Partly because of options, but partly because I’ve sort of come back around on him after looking more closely at his 2013 season. He had a decent to good 2012; he posted a 118 ERA+ and even if his advanced FIP/SIERA didn’t indicate he was quite that good, he was still more than a servicable 5th starter. Then in his first seven 2013 starts he was also very good (he had a 2.53 ERA in his first 7 starts and 42 2/3 innings … he got hurt in his 8th start). The rest of his season was a mess, with him fighting injury and ballooning his seasonal ERA from 2.53 to more than 4.00 in five more starts. If he comes back healthy to start 2014, why wouldn’t we expect more of the same performance that he had at the start of 2013? For these two reasons, I think Detwiler breaks camp as the 5th starter. Now …. I have zero confidence that he’ll remain healthy enough to keep his spot in the rotation, but that’s a problem for another day. And a problem for which this team has plenty of coverage. 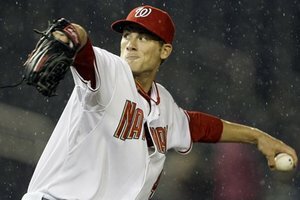 Another scenario that could affect this predition: Rizzo acquires yet another lefty reliever (latest rumors were about Scott Downs before he signed elsewhere, but I’m sure a trade could be arranged), which complicates any of these predictions because it means one less spot for either Ohlendorf or Roark. For a team that seems so obsessed with left-handed relievers, we sure have let a bunch of them go in recent years (Duke, Abad, Krol this year, Gorzelanny, Lannan, Burnett and Gonzalez last year). Maybe we should just hang on to one or two of these guys? I will say this: I do NOT believe that the Nats will choose Xavier Cedeno and his 6 2013 MLB innings for the Nats over Roark just because he’s left handed at this point. Personally, I think Roark and Ohlendorf pitched like big leagers last year and deserve to stay in the majors until they prove otherwise. Ohlendorf’s recent $1.25M deal seems to indicate he’s more likely to stick than Roark, but perhaps the long-man/spot starter competition is open as well. This pushes previous stalwards in the bullpen (specifically Ryan Mattheus ) to AAA. I will say this though: if you expect to win, you have to go north with your 25 best guys no matter how much they make or their option status. And at the end of last year, that undoubtedly included Tanner Roark. So thats why I’m going with Roark in the pen to start the season. 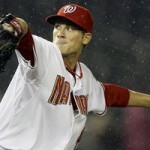 One other wrinkle; does Rizzo trade one of Storen or Clippard to Chicago, who desperately needs a closer? This seems less likely, especially for a team that has World Series aspirations, but the truth is this team is paying a LOT of money into its bullpen ($25M and counting), has three closer-quality guys, and potentially a log jam of righties (see the AAA bullpen prediction for more). I see this as less likely unless Chicago sends back pieces that we really need, but rumors get started because GMs are talking, so maybe this still happens. But if a guy like that is traded, then that re-opens a slot for the deposed Mattheus or possibly the newly healthy an electric Garcia. I think these are lesser possibilities and both those guys are pushed to AAA to begin the season. AAA Rotation: Jordan, Karns, Rosenbaum (L), Young, MLFA or two? So, the projected AAA rotation has one hold over in Rosenbaum, two “promotions” in Jordan and Karns, and then a whole bunch of question marks. Is Chris Young healthy enough to pitch this year? Is Brad Meyers? Right now i’ve got Meyers as a release candidate, figuring that he hasn’t been healthy in two years and may be finished. I have to think that the team will give a couple of lower-level free agents minor league contracts to try to pitch their way back into the league, much as they have done with the likes of Zach Duke, Ross Ohlendorf and Young in the last couple of off-seasons. There’s plenty of guys out there who may make sense; a quick glance at the current list of free agents offers intriguing names (think of someone like a Joe Saunders or a Barry Zito or an Aaron Harang; do you think these guys are getting guaranteed contracts for 2014?). I’m predicting that at least one or two of these types of guys get MLFA deals and end up in the AAA rotation, though I suppose at least one guy i’m projecting from the AA rotation could start in AAA. The AAA bullpen has a couple of MLB-quality arms in Ryan Mattheus and Christian Garcia who we know can contribute at the MLB level but who end up here because of a numbers game at the big club. The AAA closer likely is Aaron Barrett, newly added to the 40-man and looking to make his mark. Erik Davis is here, who I kind of soured on last season but his numbers in small MLB samples were good and I think he can contribute in a Craig Stammen sort of way going forward. We have a couple of hold-over loogies in Xavier Cedeno and Tyler Robertson, the latter of which successfully passed through waivers and was outrighted to Syracuse last month. We already have three off-season MLFA signings (Gabriel Alfaro, Daniel Stange, Manny Delcarmen) who all project as righty middle relievers, making it seemingly less likely that the team will retain some of its own MLFAs (the likes of Ryan Tatusko and Jeff Mandel being longer serving Nats minor leaguers who pitched decently in 2013). But as you can see there’s more candidates here than there is room on the Syracuse roster (10 for 7 spots, and that’s assuming that Pat Lehman doesn’t make the cut either). There will be injuries and D/L stints among these guys, but there may also be some releases next March. Still, a AAA rotation led by Jordan and Karns (and possibly Ohlendorf and/or Roark if another move is made at the MLB level) leaves Syracuse with a pretty good staff to start the season. And I like the fact that we have one reasonably accomplished MLB starter (Jordan) waiting in the wings to go along with a guy who might get there soon (Karns), to go with potentially a couple other former major league guys who are working their way back. We’ll see this trend again and again; despite the fact that the likes of A.J. Cole and Taylor Hill reached AA last year, the organization seems to like seeing these guys “beat the level” a second season in a row before moving guys up. And so I see these guys in AA again. Sammy Solis here is no surprise; he’s nearly 26 and has been mentioned as a MLB bullpen candidate already. Meanwhile for the time being i’ve got Blake Treinen here, repeating the level, but can also see him moving up to AAA. His numbers were good but not *that* good last year, and I left him in AA assuming that the team will try out some re-treads in the AAA rotation. Lastly Blake Schwartz gets a deserved promotion after leading Potomac in IP, wins and starts last year. In the bullpen I think Robert Benincasa is your closer to start, with Richie Mirowski and Neil Holland continuing to put up dominating late-innings relief. All three guys should be pushing for promotions to AAA. We’re a little light on lefties here admittedly. A couple of injury-prone guys in Ryan Perry and Cameron Selik are listed as release candidates in the face of a number of guys meriting placement here. Paul Demny and Rafael Martin have been around forever and may also be release candidates at this point, but they also could (at least in Demny’s case) convert to relief and try to rekindle their careers. Lastly, there’s newly acquired Matthew Spann, the bounty for the Nats gambit on David Dejesus near the end of last season. He’s a lefty who looks like he could start but i’ve got him in the bullpen for now. I don’t think there’s too many surprises in this rotation: Matthew Purke leads the line and should push for a promotion mid-season. If he doesn’t dominate High-A at this point it may be time to think about moving him to the pen. The same can be said about Brett Mooneyham and especially Kylin Turnbull, two guys who (by now) should have accomplished this level. Otherwise the rest of this projected rotation are three guys who succeeded in Low-A in 2013: Dixon Anderson, Pedro Encarnacion and Dakoda Bacus. In the bullpen, at this point i’m not sure who the closer candidates are to start the season. Perhaps Greg Holt starts in the role. Perhaps low-A phenom Gilberto Mendez gets a shot at closing. Both Holt and Rob Wort may belong in AA at this point; Wort began 2013 there but there’s a lot of relievers in that AA section who would have to get hurt/be released to make room for these two guys right now. There’s a couple of decent swingmen candidates here in Ronald Pena and Ian Dickson both started for long stretches in Hagerstown and could be useful guys in Potomac. There’s a lot of names in the mix here for this bullpen; from here on down there could be plenty of releases come the end of spring. I like this rotation, a lot. Two of our best prospects, a third guy in Austin Voth who impressed last year, a guy in Nick Lee who probably deserves a high-A rotation spot and then Auburn’s staff leader in Robert Orlan. Jake Johansen may find himself needing a promotion quickly, if he’s all that he’s cracked up to be. The bullpen is going to be tough; basically every college aged short-season guy who pitched well in 2013 is named in this bullpen competition. There’s a couple of interesting DSL graduates in Wander Suero and Phillips Valdez, some big arms in Ryan Ullmann and Nick Pivetta, and some polished college-aged lefties in David Napoli, Cory Bafidis and Jake Walsh. I have 15 names here for 7-8 spots; Viera’s extended spring training could be busy this year. Its frankly impossible to predict the short-season squads, since (especially Auburn) they exist to park newly signed draftees. However, I do see a ton of guys who competed and succeeded in the GCL this year who won’t necessarily make the Hagerstown squad, and I see them forming a good chunk of the Auburn squad. The rest of the Auburn squad will be populated with upper-end 2014 draftees and losers from the Hagerstown pitching staff competition. More of the same with the 2014 GCL squad, which was heavily tilted with DSL graduates this year. The Nats tend to focus on college arms and thus only small college guys are generally put in the GCL in their draft year.